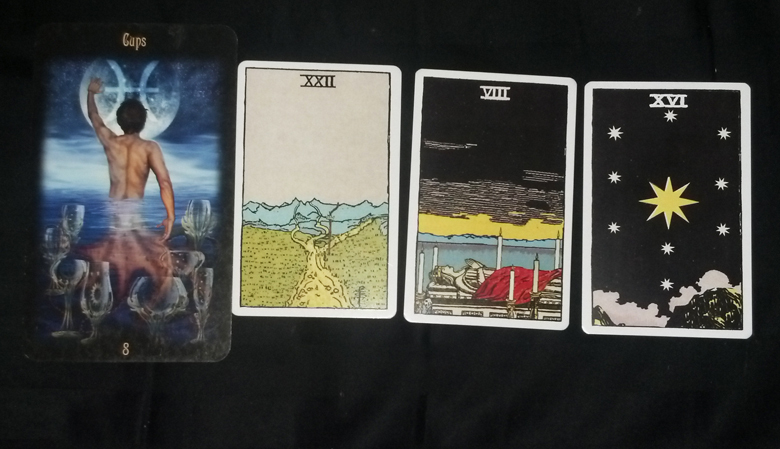 So some more experimenting - this time, an attempt to do a reading combining tarot and lenormand. Basically, draw one tarot card and have that serve as the overarching 'theme' of the reading, and then a string of three lenormand cards as the message for/response to/clarification of the tarot card. Basically the tarot still gets read as tarot and the lenormand cards still get read together, as lenormand cards ought to be. 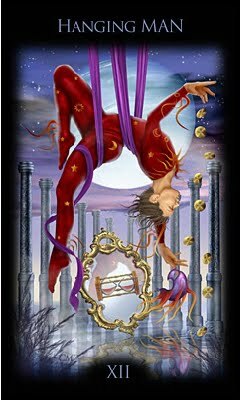 In terms of over-arching theme, we have the eight of cups. A man stands in a body of water, his back turned towards the future, the sky. Above the water he is attractively-built, strong; below it, a kind of tentacled creature, bizarre, flexible and yet so...intangible, difficult to describe. The contrast between how others perceive us and how we perceive ourselves, in our heads? Ever since I was a small child I have always had this odd feeling that my body wasn't really...me; not the way my mind was, my thoughts. Anyway, he faces away from the cups, the things he has, the place he has been, the past. Instead he looks up, towards the sky, the stars, hopes and dreams and the intangible - all the things you must work for, grasp at if you ever want a real chance at having. Turning away from the status quo to pursue more, the new. Letting go, being willing to reach. Knowing when to walk away, and what to walk away from. Then, to take a look at the lenormand cards and see what they have to say about that...We have the crossroads, which is about making choices, and decisions, being forced to figure out which road you will take, what sacrifices to make doubts; and the coffin which speaks of difficult things, depression and illness and death, of endings; and the stars, of hope and creativity and imagination, of renewal, inspiration. Given the cards around in, the coffin in this layout seems to hold a meaning quite similar to that of the Death card in the tarot. Particularly striking in this image is the ritualized, stylized nature of the thing - it isn't just death, it is death, decay preserved, romanticized, all that energy and cost gone into preserving something gone, over...reminds me of Lenin's tomb for example - quite disturbing and unnecessary, if you think about it. Better off to kill those things for good, let them go, choose to walk down the path of separation that would take you into the future towards far better, healthier, more productive and fulfilling things.The star at assures that it is possible, that you have in in you to heal, to fulfill those dreams, to do so many better things if only you could make that decision to let the negative coffin things really go. How much energy goes into maintaining that elaborate coffin, dealing with it? What kind of starry things could you accomplish if your focus could be fully turned elsewhere, if like the man you could walk away from those tired old cups? For me, this message is utterly applicable. Things that have gone on for ten years now... I truly do not know how to even try anymore and yet, the cards remind me, that I must; to not give up when I just feel so tired of the inevitability of it all. You can never get unstuck if all you do is muddle about and dwell on how stuck you are.